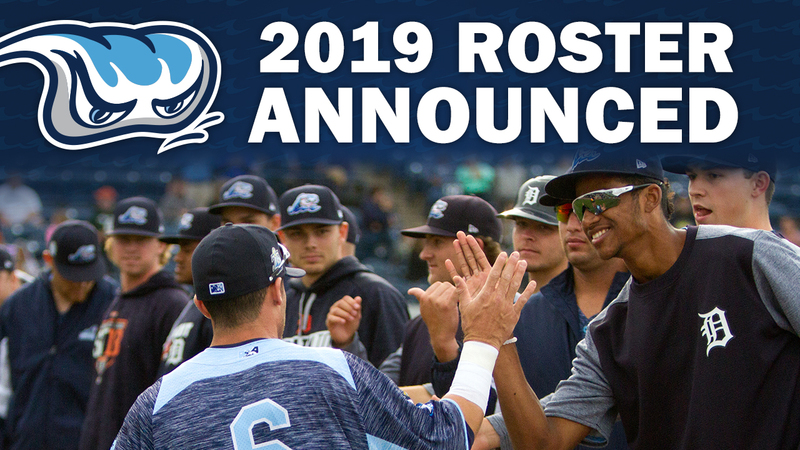 COMSTOCK PARK, MI - Manager Lance Parrish returns to the West Michigan Whitecaps in 2019, where he will lead numerous talented young players who highlight the clubs' initial 2019 roster unveiled in conjunction with the Detroit Tigers on Thursday. Headlining this year's Whitecaps roster are 12 members of the Tigers 2018 MLB Draft class, and six consensus Top 30 Detroit prospects. Leading the class is 2018 44th overall pick and outfielder Parker Meadows, who ranks as the Tigers no. 7 prospect, according to Baseball America. The younger brother of Tampa Bay Rays outfielder Austin Meadows, Parker hit .290 in 28 games between the Gulf Coast and New York-Penn Leagues and is considered one of the fastest baserunners in the Tigers organization with raw power to boot. The 19-year-old stands 6'5" and is slated to open the 2019 season as the Whitecaps center fielder. Other highly-regarded players include infielder Wenceel Perez (#11 by Baseball America), pitcher Carlos Guzman (#13 by the Detroit News), catcher Sam McMillan (#27 by Baseball America), and pitcher Wilkel Hernandez (#30 by Baseball America) round out some of the prospects headed to West Michigan. Pitcher Adam Wolf (5th) is set to begin the season on the mound and ranks as the Tigers #31 prospect by the Detroit News, while infielder Jeremiah Burks (8th) highlight the group of 2018 draftees. Three members of the class in infielder Kody Clemens (3rd), Tarik Skubal (9th), and Brock Deatherage (10th) played with the Whitecaps in 2018 and are slated to begin the season elsewhere. The common thread in this year's pitching staff is experience, as five of the six members of the projected Whitecaps pitching rotation either played during the 2018 Whitecaps season or has experienced success at the collegiate levels. Left-hander Kacey Murphy (11th) led the University of Arkansas to the Championship Round of the 2018 College World Series. The team returns nine players from its 2018 team that helped the Whitecaps clinch a playoff berth for the fifth consecutive season, including pitchers in Hernandez, Drew Crosby, and closer Billy Lescher. Position players are headed back to West Michigan after playing with last year's squad include Perez, catcher Chris Proctor, infielders Johnny Valente, and Jordan Pearce with outfielders Reece Hampton and Ulrich Bojarski. Parrish returns for his second season to manage the Whitecaps managerial debut after leading the club to the postseason in his first season at the helm. The former Detroit Tigers catcher played 19 seasons in Major League Baseball from 1977-1995, including ten years with the Tigers and playing a prominent role on the Tigers 1984 World Series championship team. Parrish's coaching staff consists of hitting coach and Hudsonville, MI native John Vander Wal, and pitching coach Willie Blair, who played parts of four seasons for the Tigers round out the staff. The Whitecaps have an Open Workout scheduled for Wednesday, April 3 from 11:30 a.m. - 1:00 p.m. to welcome back the boys of summer to Fifth Third Ballpark before their scheduled home opener Saturday, April 6 against the South Bend Cubs at 4:00 p.m. The first 1,000 fans in attendance for Thursday's game receive a Whitecaps 'Franky' winter hat; courtesy of Fifth Third Bank. Season, group and individual tickets are available for any 2019 game by calling the Whitecaps' front office at 616-784-4131 or visiting www.whitecapsbaseball.com.